Discussion in 'Scheduled Matches' started by Lanzer, Mar 9, 2017. "The gate flickered one final time as the last Eldar crossed the threshold. The Great Enemy was here in the wretched form of the fallen mon'keigh warrior. "This should be an easy fight. Those primitive apes stand no chance against the combined might of our warhost!" The elder Warseer turned to the young Avenger bristling with furious wrath, and calmly replied: "Those ...apes," he said, pronouncing the word as if holding something disgusting between his thumb and index finger, "are more like gorillas...clad in heavy plated armor, wielding weapons of great destruction. Would you still call them such when they enter your shrine, destroy your home and slay your family? Never underestimate the enemy. Now go and assemble. We have a place to cleanse from corruption..."
Eternal Battles is hosting Match #2 on Saturday, March 11, 2017. This match will not be streamed due to the observer camera not being ready for use. Thana, Paeyvn, Twirl and 2 others like this. "To hell with those weaklings. And damn those Eldar..." He took a look around the battlefield, filled with the corpses of weaker Chaos Marines. 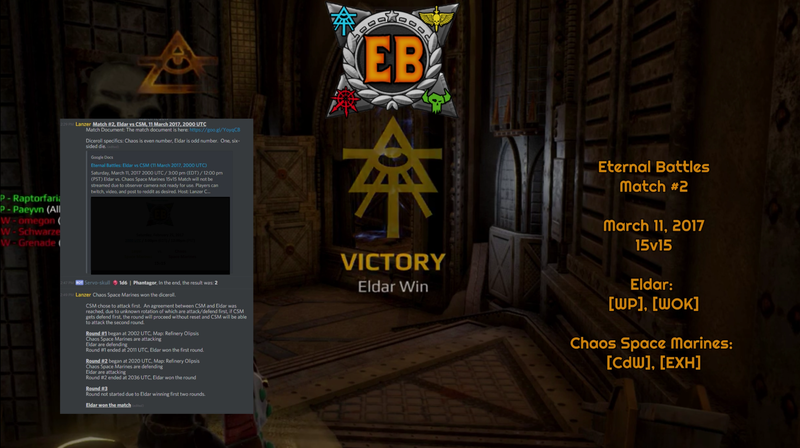 The Eldar had paid a harsh prize for this win. But they won...and it would take him another century or two, to get enough Chaos Marines back to start another incursion. With a bloody grin, he turned around and left through the Warp Portal that had just opened. He'd have a talk with those Chaos Gods for leaving him to die on the battlefield, not granting him any victory against the Eldar at all..."
Plazm, Safreadis, Thana and 1 other person like this. Plazm, Ephaistos, Safreadis and 7 others like this. Plazm, Ephaistos, Safreadis and 3 others like this.